the musings of a charming terrycloth primate of the world. as soon as i heard 2008 was going to be a leap year i started working diligently on my grande jete's, saute de chat, and my crowd pleasing saute de basque. i was determined to leap as much as possible in 2008 and wanted to put my best foot forward. after all those hours in the studio i'm a little disappointed to find out that leap year has less to do with a grand pas and more with some calendar faux pas. some say the egyptians came up with the idea of adding an extra day every 4 years to keep their calendar in step with the seasons and julius caesar get credit of tucking that extra day into february. pope gregory the xiii is accused of standardizing leap year so that it occurs in any year evenly devisable by 4, but, no one is stepping forward to take credit for the name. would you? it's false advertising. the whole year is not leaping. it's not even bouncing around a bit. it's just one day that saunters in every four years like the kid that always shows up for the math club yearbook photo, but never attended any of the meetings. sure it brings the yearly day count up to a nice even 366, but that's nothing to twist and shout about unless you are the kind of person who likes numbers that are evenly devisable by 2, 3 and 6. i'm sure some european country has a holiday devoted to leaping where i can dazzle revelers with my grand jete en tournant and a sisson or two! 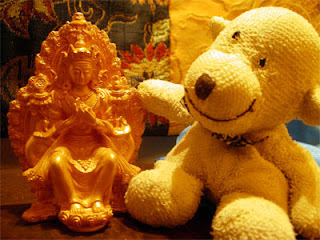 valentine's day is all about love, so, it's no coincidence that i'm kicking of my "know your buddhas" series with my little golden friend here. say hello to the buddha maitreya! today, he's decked out in his fancy silks, elaborate jewelry and matching crown. other times, you'll see him in a simple monks robe sitting peacefully. no, that's not a gang sign he's making, it's a gesture that means that means he is teaching. his name is pronounce my-tray-uh and comes from the sanskrit word maitri and means universal loving kindness. maitraya is a future buddha, so, he's not scheduled to show up until the previous buddha's teaching have degenerated and have been forgotten and everyone's in a bad mood. that's when our buddhist bundle of love will show up and start spreading the love and kindness. i predict he's going to be a big hit. of course i'm limbering up my loving kindness now! feel free to join me! Labels: know your buddhas, love, maitreya, valentine, valentine's day. what says "i love you more than anything else in the world" more than healthy heart. just take a gander at these attractive and well formed p waves. a respectable pr interval, pointy and pert qrs complexes folowed by a relaxed st segment and a nobel t wave. it's obvious that this little heart beat just screams "i love you!" in a dignified electrocardiographic way, of course. 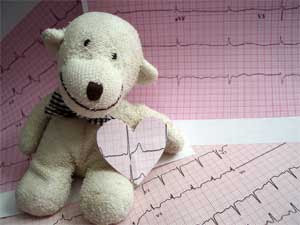 like any muscle, the heart needs excercise to keep it fit, so, i'm ready to give it a working. so, i'll love my heart with a brisk walk and i'll put my hear in everything i do. the perfect combination for years of love and happiness. coming up later today - two special features! 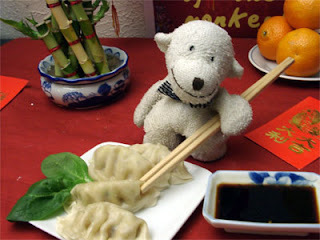 know your buddhas - featuring a special valentine guest - the buddha maitreya and a valentine's day "ask monkey" feature. Labels: ecg, electrocardiogram, valentine, valentine's day. it seems like only 38 days ago we welcomed in a new year. now, it's time to celebrate the lunar new year or as my tibetan buddhist pals like to call it, losar (lo means year and sar mean new). losar celebrations date back to the pre-buddhist period and the indigenous spirituality called bon. today, however, it's inseparable from buddhist practices to prepare for and celebrate the new year. a good house cleaning gets things physically tidy while a day of rituals devoted to removing obstacles and negativity tidies up the spiritual end of things. new years day starts off fresh with special prayers and ceremonies for longevity, prosperity and auspicious activity and is sure to include a fire offering followed by special snacks and beverages. momo (dumplings), kapse (fried bread), chang (barley beer) and po cha (tibetan butter tea) is sure to be on the menu along with other treats both sweet and savory. for his holiness the dalai lama, it's traditional for him to consult the ngechung oracle during losar. for everyone else who doesn't have an oracle of their own, it's a time to celebrate and spend time with family and friends. tashi deleg losar! (auspicious blessing for the new year!) and welcome to 2135 the year of the earth mouse! gassy old star to be eclipsed!